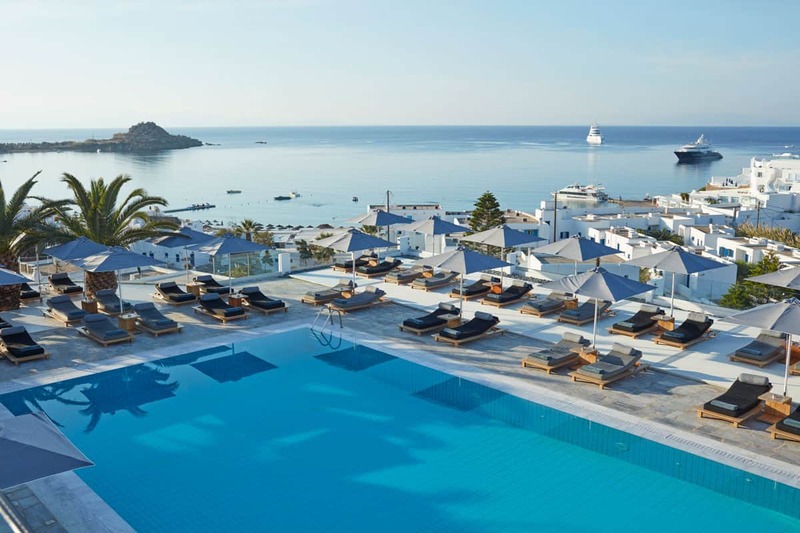 The aptly named Ambassador 5-star luxury hotel captures the very essence that draws the world to Mykonos. Built in sympathy with the slope, mere steps from the fine sands of Platis Gialos, its architecture blends contemporary chic with tones and textures borrowed from the local vernacular. Enjoy the light-filled mornings that drift effortlessly into perfect poolside afternoons at a terrace that is a world unto itself, with casual lunches and ice-cool cocktails served from George’s Bar. And as shadows lean towards evenings, guests mingle over sunset aperitifs, before dining in the candle-lit glow of Efisa, one of the island’s top tables. Step into the contemporary elegance of an open-flow room leading onto a private balcony with views of the sea and the surrounding hillsides. Sophistication and comfort are invested in every detail: marble floors, floating shelves, walls and crisp linens all play to the power of pure white, while subtle touches of classic blue are softened by wood accents and superb mood lighting. A Flos designer fitting hangs over the desk like a floating moon, and striking customised lights glow at the bedsides. This is an oasis of quiet intimacy and luxury. The room’s contemporary open flow opens out onto a private balcony or terrace with endless views of the Aegean. Sophistication and comfort are invested in every detail: marble floors and floating shelves, walls and crisp linens all play to the power of pure white, while subtle touches of classic blue are softened by wood accents and superb mood lighting. A Flos designer fitting hangs over the desk like a floating moon, and striking customised lights glow at the bedsides. Coming from the vibrant atmosphere of the outdoors, it is an oasis of quiet intimacy and luxury. True Blue rooms are available in 3 different constellations, all of which enjoy full sea views: a balcony or terrace with coffee table and two chairs, a terrace with private Jacuzzi and loungers, a terrace with private pool and loungers. The spacious elegance of this contemporary ‘open flow’ room expands onto a private balcony or terrace with views of the Aegean. Luxury and comfort are invested in every detail: marble floors and floating shelves, walls and crisp linens all play to the power of pure white, while key notes of classic blue are softened by wood accents and superb mood lighting. A Flos designer fitting hangs over the desk like a floating moon, and striking custom lights glow at the bedsides. Coming from the vibrant atmosphere of the outdoors, it is an oasis of quiet intimacy and indulgence. The White Bliss rooms are available in 3 different constellations, all of which enjoy full sea views: a balcony or terrace with coffee table and two chairs, a terrace with private Jacuzzi and loungers, a terrace with private pool and loungers. This unique Horizon retreat is quite literally ‘a cut above’: the most extravagant celebration of outdoor living, situated at the highest point overlooking Platys Gialos, with views that reach all the way across Platys Gialos to Scorpios and beyond. A 20m2 veranda and magnificent 40m2 all-marble pool double the living space of 35m2 interiors. These are beautifully conceived and detailed, entirely clad in white marble, with floating shelves, crisp linens, warm touches of wood joinery, mood lighting and signature pieces by celebrated international designers. All-white soft materials are accented by flashes of blue that recall the vast sea and skyscapes that will take you breath away at every turn. From luxurious loungers, in dappled shade of the pergola, you will feel that you are somewhere between Cloud 9 and 7th heaven. A luxurious expanse, flowing from the contemporary elegance of a spacious suite onto a private terrace that commands sweeping views of the Aegean. Sophistication and comfort are invested in every detail: marble floors and floating shelves, smooth walls and crisp linens all play to the power of pure white, while subtle touches of classic blue are softened by wood accents and superb mood lighting. The bathroom experience is pure indulgence, a deep bath, rain shower and amply stocked with luxury cosmetics. A Flos designer fitting hangs over the desk like a floating moon, and striking custom lights glow at the bedsides. Coming from the vibrant atmosphere of the outdoors, it is an oasis of quiet intimacy and indulgence. The Thalassa suites are available in four different types: balcony or terrace with sea view and seating; terrace with private Jacuzzi; terrace with shared pool; terrace with private pool. Offering spacious open-plan living, the beautiful Azure suites are an all-white oasis with touches of blue that recall the aquamarine Ambassador pool immediately below, and the expanse of sea that extend to the horizon line. Enjoy this unique view from the loungers and private Jacuzzi of the broad outdoor terrace, or even from your bed while drifting into mid-afternoon siestas. This exceptional suite with a shower and freestanding feature bath, king-size or twin beds, and a seating area with a sofa bed, accommodates up to 3 people. A unique room at the Ambassador that epitomises Myconian living, with spacious and luminous all-white interiors that open onto the deep blue expanse of full sea views from a large furnished terrace with comfortable sunbeds and a private Jacuzzi. The 45m2 room enjoys the romance of a king-sized four-poster bed, has both a shower and freestanding feature bath, as well as double vanities that are amply stocked with luxury cosmetics. Suited for 2 adults, this is a wonderful choice for couples wishing to enjoy the privacy and beauty of their luxurious suite as a tranquil counterpoint to all the attractions that abound at the Ambassador and on Mykonos. This 45m2 suite was conceived by the Ambassador for honeymooners or hopeless romantics wishing to unwind in leisure and create treasured memories in a unique setting. Featuring an open-plan living room with natural stone walls, a bathroom with shower and lounge area, it leads onto a scenic terrace with Jacuzzi and soft upholstered loungers from which to enjoy the vast expanse of the Aegean Sea at all times of day. An exclusive, eight-bedroom paradise built in the evocative Myconian vernacular, with hardwood floors and contemporary interiors in harmony with the panoramic views of the bay and the surrounding hillsides, and a spacious outdoor area with landscaped garden that celebrates island living. Designed as a private home with every comfort and indulgence in mind, the villa has the ability to transform from an oasis of tranquillity and privacy suited to smaller groups, to an entertainment hub that can sleep up to 22 guests. The rooms occupy two levels and can be connected or separated at will in a constellation of two, four, six or eight bedrooms. Four en-suite bedrooms on the lower floor lead out onto the spacious terrace that doubles the living space, with a covered patio, an infinity pool and open-air Jacuzzi. On the upper floor, four luxury en-suite rooms, all with tubs and showers, open onto a sunbathing terrace with endless views to the horizon. Amenities include a fully equipped kitchen and ironing facilities, a private bar and the high-tech comforts of 3-D, satellite Smart television with DVD player, iPod docking station and wireless Internet connectivity. We’ve even added an open wine cellar and private drive-in parking. The Myconian Ambassador is situated just above Platis Gialos beach on the south coast of the island, renowned for its clear water and fine sands. The famous beaches of cosmopolitan Psarou, picturesque Paranga and Agia Anna are within easy walking distance. Rooms and suites are designed for maximum space and comfort, with an open flow underpinned by the elegance of contemporary lines, bold proportions and natural textures. The cool touch of marble finds its counterpoint in the tactile warmth of wooded detail. The private balconies and terraces command legendary view. Enjoy a range of traditional therapies at the on-site hotel spa. Flooded with morning light and overlooking sea views that spill in through generous windows, Latitudes is the perfect place to start to your day. Efisia offers a gourmet menu in the Relais & Châteaux tradition, pairing a culinary experience with luxurious atmosphere. With its panoramic view of the entertainment terrace, George’s Bar is an ideal meeting spot and a perfect vantage point from which to watch the day’s rhythms unfold. For those rare evenings when you feel like ‘staying home’ to catch up on sleep, work or TV entertainment, we offer a delicious in-room menu with something exceptional for everyone’s taste, guaranteed to arrive as hot or as chilled as the chef would have it.